Total relaxation and comfort in an easy-to-assemble kit! Even the conduit is installed in the wall panels of these kit saunas. Wall units fit together easily and provide greater flexibility. You can even take your sauna with you when you want to relocate. Interior surfaces are made of Western Cedar. Cedar or Luan Mahogany paneling encases module exteriors. 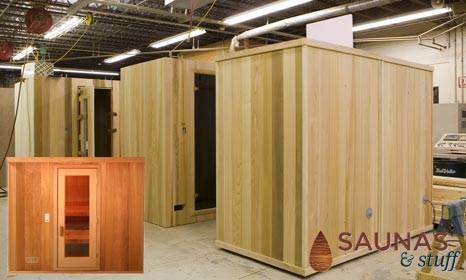 Sauna assembly times vary by room size and shape, and can take as little as 1-2 hours.